I realize I haven't given you much of a taste of German cuisine while I've lived here in Berlin. As you probably have heard me complaining about before, the winters here are rough. No, it's not the low temperatures or crazy blizzards. 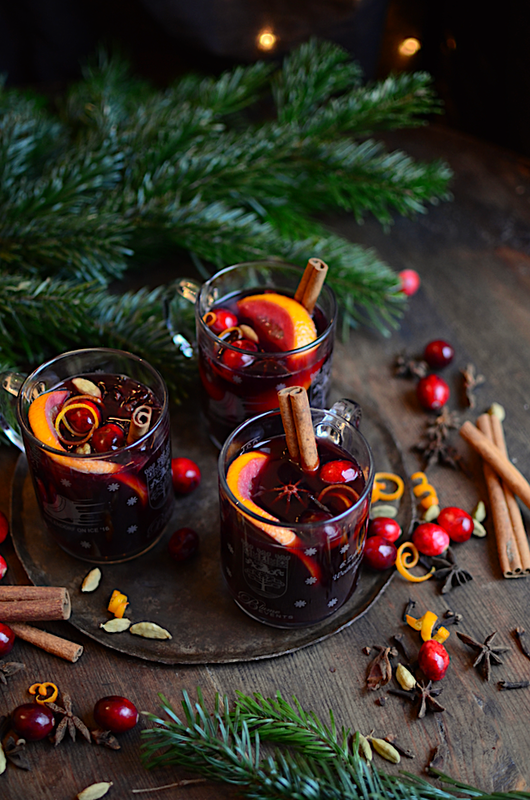 Those would be quite welcome on a rainy, 40ºF December day like today. No, the weather is not what makes winter in Berlin rough. It's the sun. Or the lack thereof I should say. On a cloudy day, it gets dark by about 3:30 p.m. Unacceptable. So what do you do if you are living in these northern parts of the world, poking your pale face out of your window in the early afternoon to try to absorb the last faint rays of sunlight through the drizzly haze? 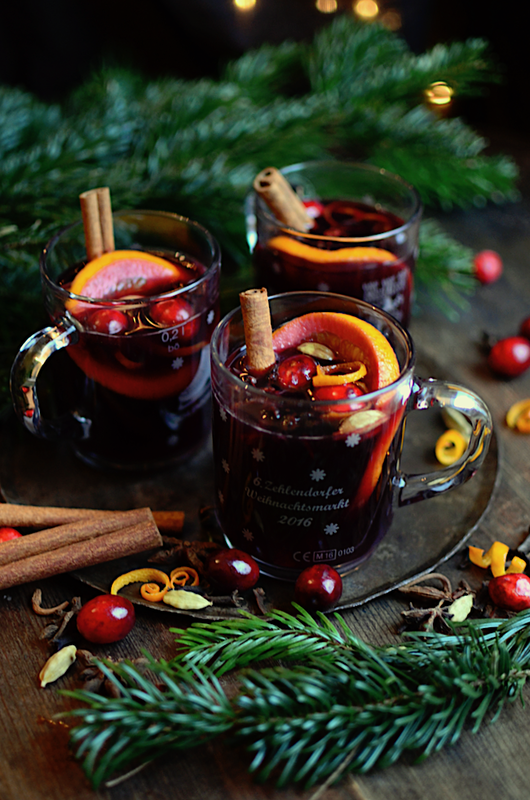 You must invent a cheerful atmosphere with festive traditions, that's what. It's a matter of survival. And it's what the Germans have successfully done. 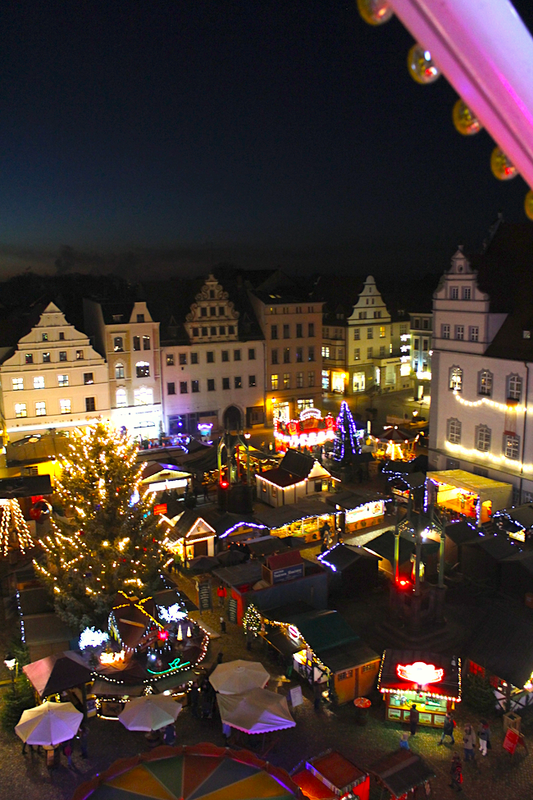 Allow me to introduce you to the Weihnachtsmarkt, or in English, Christmas Market. Every year in Berlin (and in all of Germany) Christmas markets start popping up just when it starts getting too dismal outside for you to handle anymore. 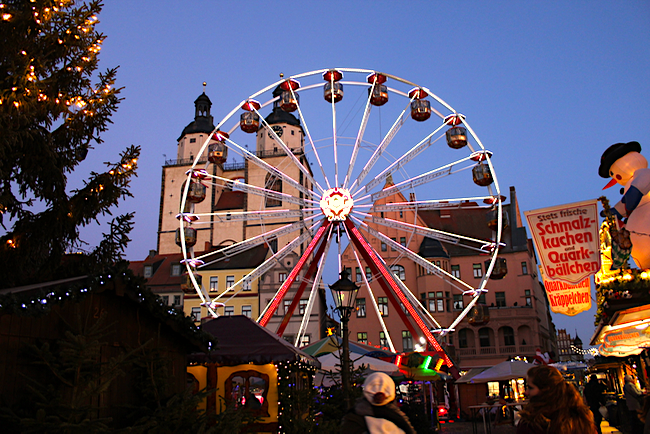 The Christmas Markets are full of warm sugared almonds, fat sausages, Nutella stuffed crepes, crafts and trinkets to buy, train rides and ferris wheels, hot chocolate, and most importantly, Glühwein. 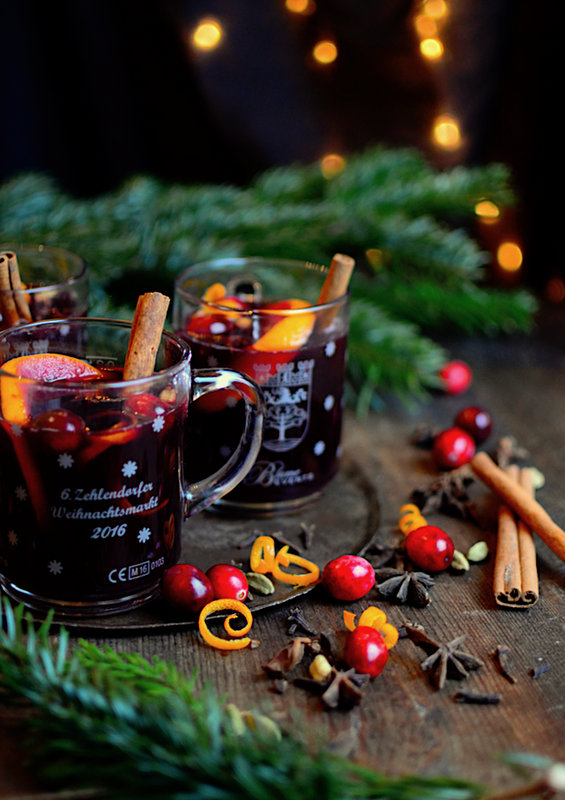 At every Christmas market, you can find Glühwein (mulled wine) that is given to you in a real mug. You pay a couple extra bucks when you buy the drink and you get it back when you return the mug, or you can keep the mug as a keepsake. 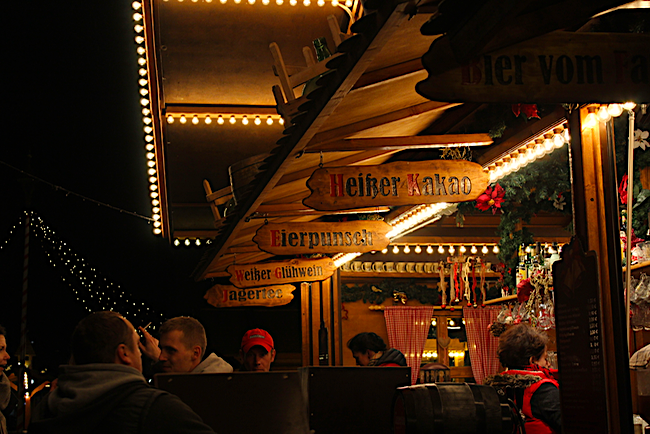 They're different for every Christmas market too, so they're good if you're into collecting stuff. Fun. 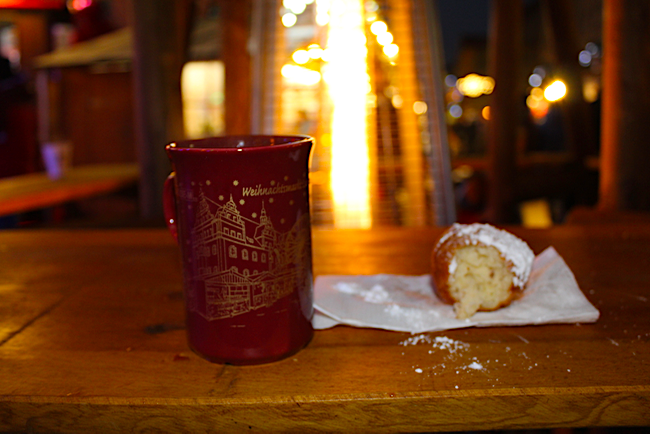 Here is a mug of Glühwein that my sister was enjoying with me at a Christmas market in Wittenberg along with a quark ball (that's the doughnut in the picture, which is made with quark). She took all of the Christmas market pictures you see here. She also has a fun blog. You can check it out here. Guess blogging runs in the family. 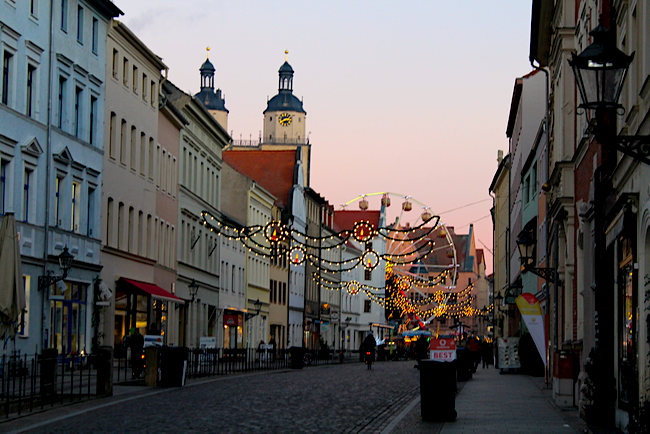 The Wittenberg Weihnachtsmarkt was very picturesque, as you can see. Especially from the top of the ferris wheel. And just when we thought it couldn't get any better, we realized that we could spin the compartment as the ferris wheel was going. It was way too much fun and I think maybe the ferris wheel guy though that we had had a little too much Glühwein when we stumbled out at the end. 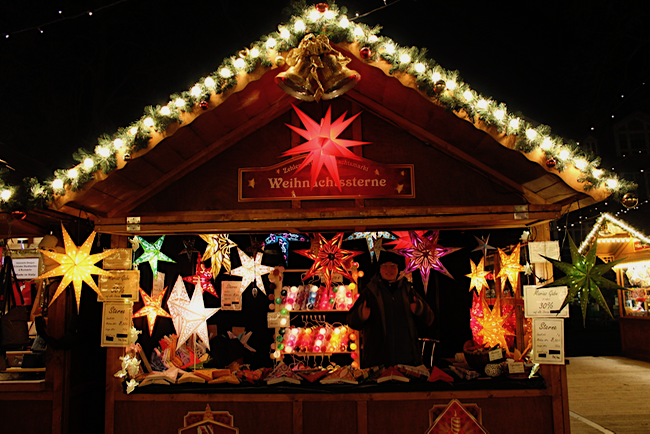 We've been to several Christmas markets in Berlin, but my favorite is the little one right by our apartment. It's small, but it's ours. Plus, I finally got one of these 3-D Christmas stars this year that I've been coveting since I first saw them popping into windows all over the city last Christmas time. You can see the star seller is optimistically giving a thumbs up. I guess he was happy he made a sale. 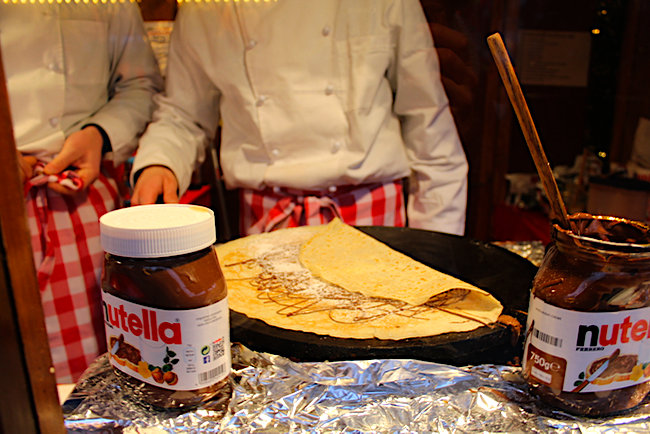 And then there's this crepe guy. 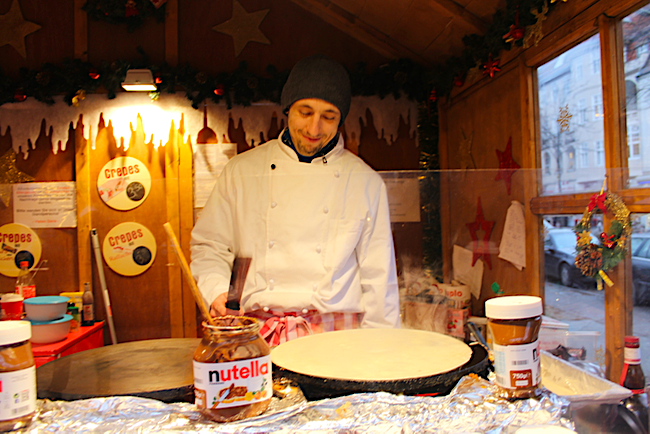 Here you see him cheerfully whipping up a crepe for my sister. She had tried to buy a crepe two or three times before this, but she always arrived just too late as they were closing up. So finally, when she arrived on time, he offered it to her for free. Anyway, let's get down to business. 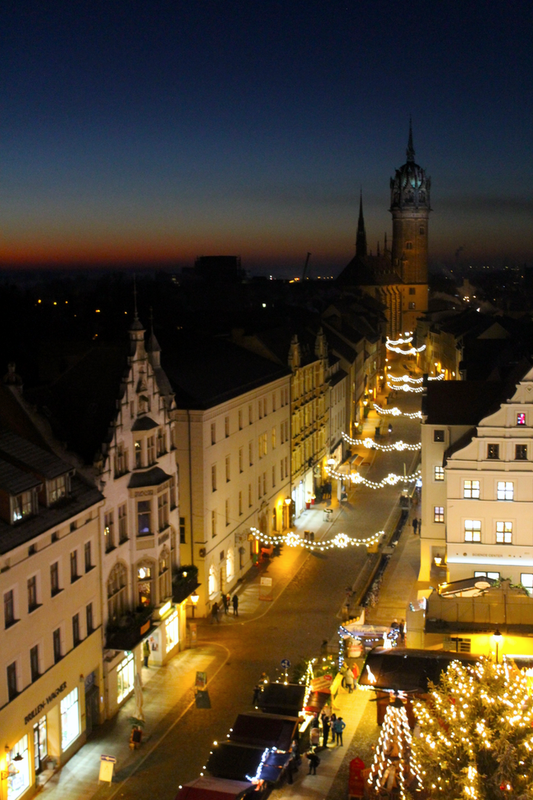 You want to come to Germany someday at Christmas time, but you need to satisfy your desire to experience the charm and warmth of the German Christmas market now. 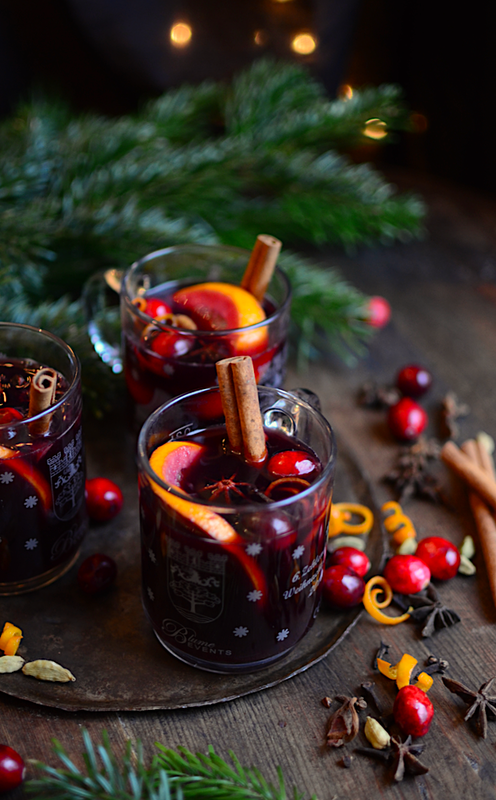 I have been drinking my homemade Glühwein out of these mugs from my Christmas market. I am debating whether or not I can part with them and give them back to the market for my money back. Am I allowed to just keep them for a test period? Please say yes. 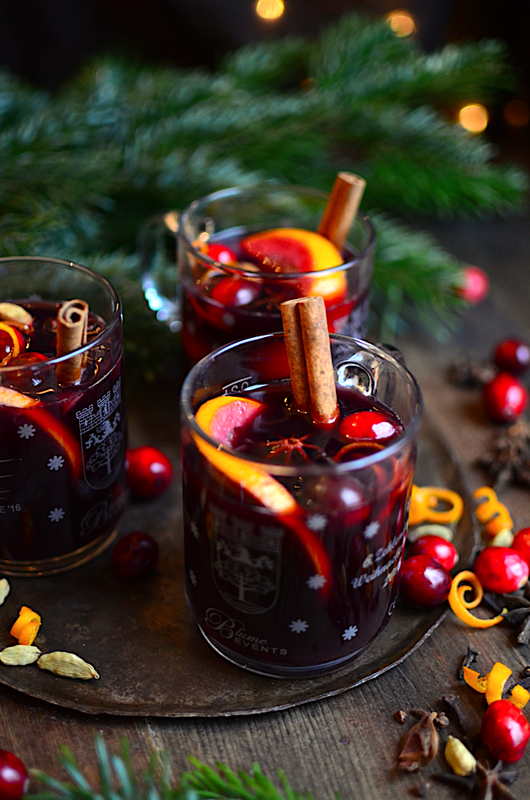 Glühwein is a tradition that I want to bring home to America with me and enjoy every year. 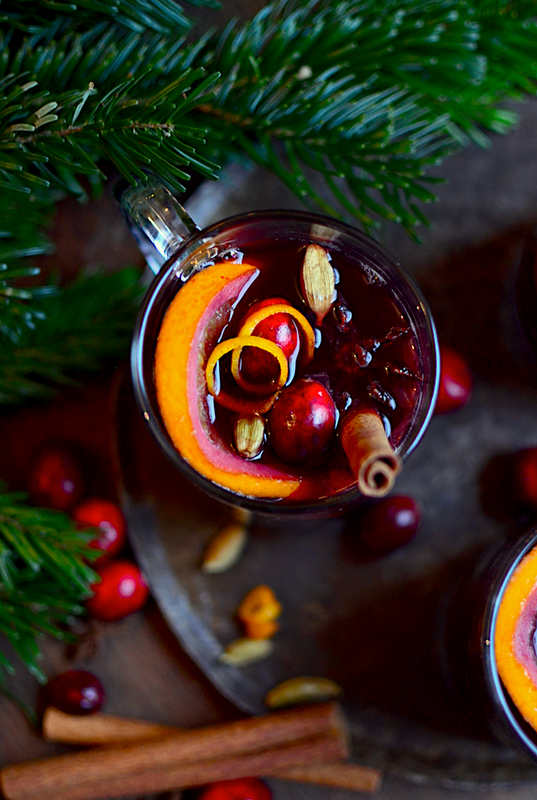 There's nothing better than standing under strings of lights and sipping down the warm, spiced wine while laughing with friends. Feel free to switch up the spices, use different sweeteners, or even try it with white wine! There's no right or wrong. You can even throw some ground spices in a mug and microwave it in a pinch. Enjoy! Place the spices orange juice, and sugar in a pot. Simmer for at least 10 minutes until the sugar is dissolved and the flavor of the spices is released. Add a few tablespoons of water if it starts bubbling up and thickening. Reduce heat to low and add the wine and orange slices and cover. Simmer on low until hot. Do not boil it or the alcohol will evaporate. You can keep the pot on the stove covered as you drink it. If it seems to be losing alcohol content, add a little more fresh wine to the pot. Use mugs, not wine glasses. You can also mix the wine with the spiced syrup and then strain it back into the bottle and heat up a glass at your convenience. To make the curly orange peels, peel an orange with a peeler, then slice the peels into strips and curl them with your fingers. Here are some optional add-ins if you want to spice things up (literally). Also feel free to add a shot of rum. Nobody's stopping you.